Computer programmers have always loved caffeinated beverages, whether Mountain Dew, Jolt, or plain old coffee. It helps them keep their groove going overnight as they crank out code. German hackers, however, prefer a lightly carbonated yerba maté iced tea called Club-Mate (kloop MAH-tuh) and lately this beverage has made its way to the United States where it’s caught on among the homegrown hackerati. Emmanuel Goldstein, publisher of hacker zine 2600: The Hacker Quarterly, first encountered Club-Mate at a convention in Germany. Hackers seem to love the fact that Club-Mate keeps them up at night without the crashes and jitters that accompany other energy drinks. “The buzz just slowly dissipates and you can go to sleep if you need to,” Goldstein explains. At the same time, the beverage has a taste that the most adventurous of foodies would describe as unique. Many people find it repulsive when they first taste it, and yet, Club-Mate has found legions of fans around the world. In 2008, Goldstein set about importing Club-Mate to the United States, intending to feature it at Hackers on Planet Earth (HOPE), a hacker convention he helps organize. It was quite an undertaking. The pallets had to be shipped from Europe via freighter, and there were frequent delays. Goldstein is now the sole U.S. distributor of Club-Mate. A 12-bottle case costs about $60 with shipping. A pallet of 800 bottles comes to about $3 per bottle. Either way it’s a pricy proposition, which has led some fans to question the need to ship the product from thousands of miles away when theoretically, it could be brewed in anyone’s kitchen. Faced with the steep costs of shipping Club-Mate, and knowing that he could easily acquire the basic ingredients, Toews decided to brew his own. Toews (pronounced TAYVZ) began with a kilogram sack of yerba maté (yur-buh MAH-tay), the heavily caffeinated herb that provides the core flavor of the beverage. Known to scientists as Ilex paraguariensis, yerba maté is a species of holly used to make a traditional South American tea, drunk from a gourd. 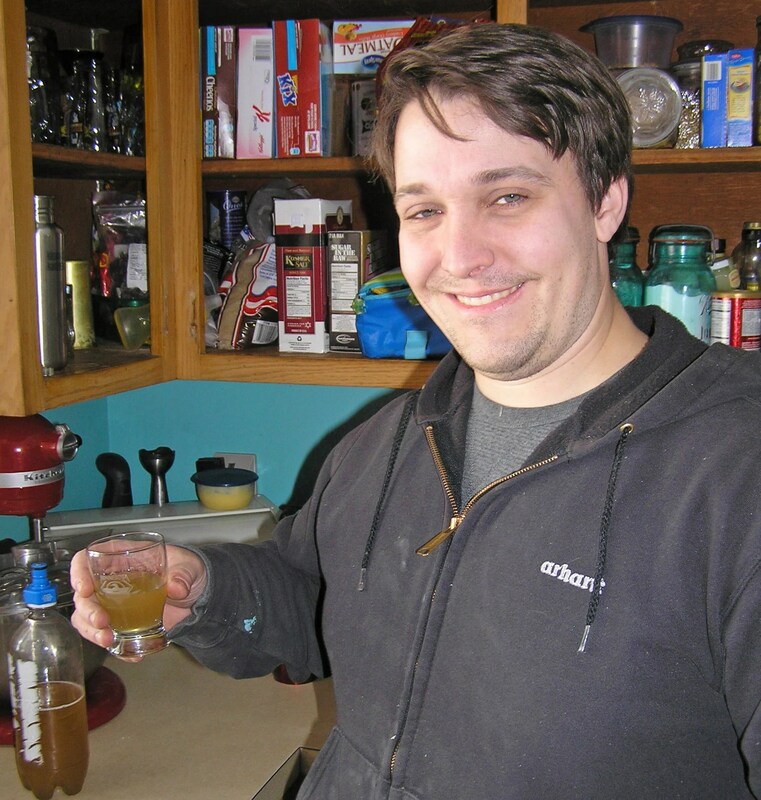 After steeping the yerba maté for five minutes, Toews strained the tea and added the other ingredients — the agave and a bit of citric acid for tartness — then carbonated the result in his kegerator. Intent on matching the flavor of the original beverage, Toews set out to equal its sweetness. His wife, Sarah, provided invaluable assistance, suggesting various combinations of simple syrup, corn syrup, and molasses in place of some of the agave. Toews also reduced the steeping temperature a few degrees to help mitigate the astringency of the first batch. With batch six, Toews called it done. The resulting beverage, which he calls Dave-Mate, is extremely close to the original, while displaying a unique twist. So what’s next? “I think I’d like to try a hybrid process in which I melded the maté with a light-style beer to make a hacker-friendly alco-pop,” he says. He’s excitedly producing batches of Dave-Mate for the new Twin Cities hackerspace, the Hack Factory. “It would be my small contribution to insomnia for the sake of creativity,” he says. Heat the water to 75°C/167°F, then steep the yerba maté in the water for 5 minutes. Strain the tea into another container. You may need to filter multiple times to remove all the sediment. Add the sweeteners, citric acid, bitters, and guarana. (Simple syrup is 1 part sugar dissolved in 1 part hot water.) The guarana simply serves as concentrated caffeine — it doesn’t add any flavor, but it may affect the overall flavor of the beverage. Stir until blended, then carbonate. Toews used a 1L soda bottle with a carbonator cap, then added CO2 from a cartridge using a method called forced carbonation. This equipment and instructions on the process may be found in any home brewing store.